The ex-cop-car "Battle of the Badges" charity race at the weekend's Missouri State Fair was a mess. 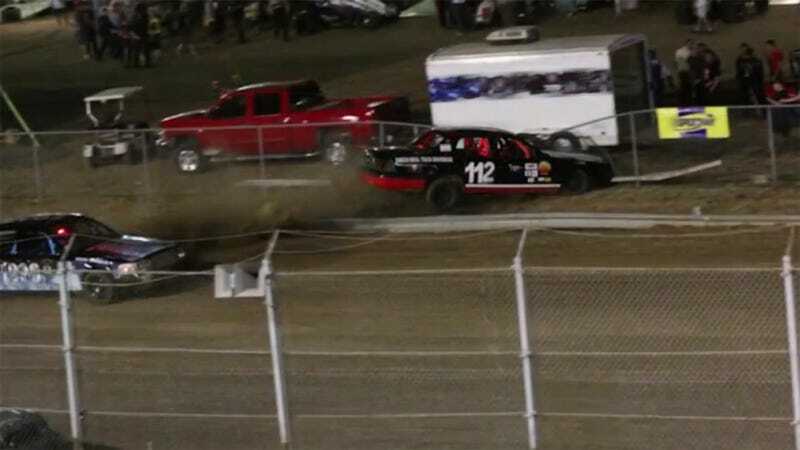 One car hit five spectators in the infield, two of whom remain in the hospital, and that wasn't the first crash of the night. The participants in this race were not experienced race car drivers, but local law enforcement officers, many of whom were racing for the first time. Off-duty police officer Tyson Russell, 25, got caught up in a multi-car crash, lost control, and speared off through guardrail barrier and a safety fence in his Crown Vic, hitting five spectators. Two were airlifted to a hospital in Columbia while a third was taken by ambulance to a nearer hospital. Two remain hospitalized. Less than an hour earlier, another driver, just 15 years old, crashed and had to be airlifted to Columbia for serious injuries. The Columbia Missourian reports he is in stable condition. Archie Simpson, 67, was hit in the leg during the later crash and described the scene to KLTV7. I seen the car coming. And I hollered at another friend of mine that was standing there beside him. So we hit the ground, me and him both. Pretty scary. I had been going to races for 35 years, and I have never seen anything like that one. Should the state fair no longer allow inexperienced drivers on a track, or do they just need better safety precautions at the speedway itself?